Last October Experience Romania invited me to explore their beautiful country, learn about their history and culture, and like their name implies Experience Romania. Along the journey, I discovered that Romania’s hospitality industry had developed further than you would expect given its recent communist past. In fact, one hotel stood up amongst them for its modern design and elegance. Enters the pride and joy of Romania’s Hotel Industry: Hotel Privo. Nested in the heart of Târgu Mureș, Transylvania Hotel Privo – resembling the mansion in the movie Ex-Machina - shines like a solitary gem in the quaint little town. The hotel is not only beautiful and modern but has won numerous awards for its architecture and cuisine. The Romanian hotel offers its guest first class experience in a warm environment juxtaposed with an ultra modern and minimalistic design. Hotel Privo is a two-building hotel. The main building offers rooms with the minimalistic design they are known for. For instance, as you walk out of the elevator, you will be greeted by a seamless hallway. But upon close inspection, you will notice the doors to the room. Additionally, the room's closet and bathroom doors are all as well seamless giving you the feeling of clean and open space. In contrast, the adjacent building - connected through the lobby - Vila Csonka is an Art Nouveau style building. The owners originally purchased the lot with the shabby building and invested in its renovation and construction of what it is today Hotel Privo. The historical building offers rooms with a delicate mesh of modern and traditional decor. Additionally, the rooms provide all the amenities you would come to expect from a luxurious hotel. If you are a wine lover, rejoice! 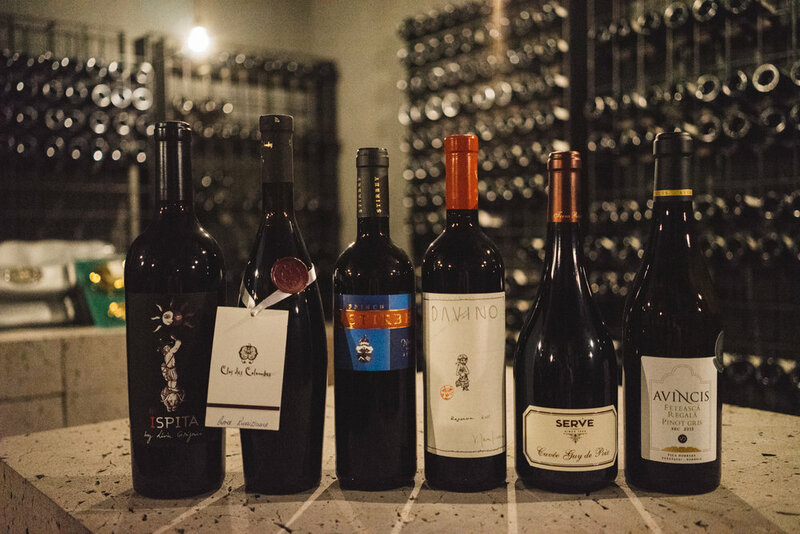 You will be happy to learn that Hotel Privo has a great selection of wines sourced globally and locally. In case you have a hard time deciding which one to try, the in-house sommelier can guide you through the range. As you visit Romania, I highly recommend trying the local wine. I usually recommend skipping the hotel's restaurant and opt for something local, but dining at the Hotel Privo award-winner restaurant is a must. On the menu, you will find a great variety of dishes, ranging from Argentinian fillet to Asian fusion to risotto - ready to satisfy any craving. 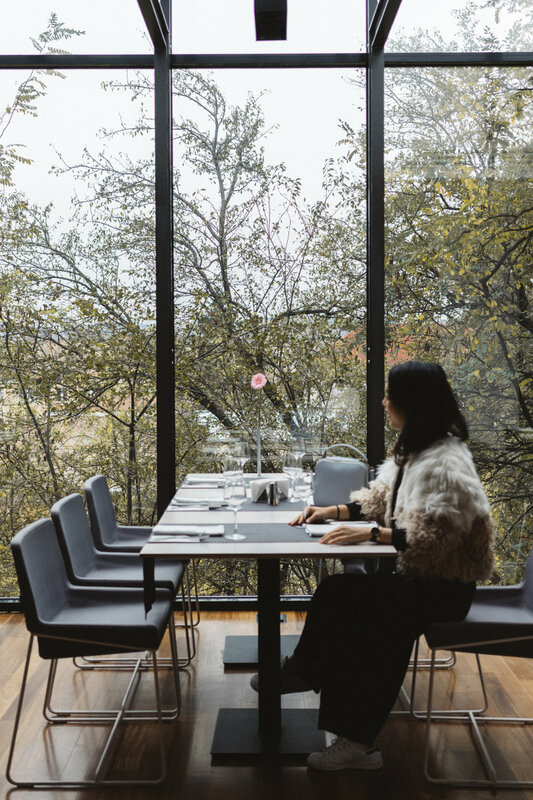 The décor of the restaurants continues the minimalistic design of Privo; and the glass-wall, covered by greenery, gives you the illusion of dining in a garden. Additionally, the hotel provides a separate dining area serving continental breakfast. At the spa and wellness center, you will find a sauna, a steam room, and a Jacuzzi. Right after settling into my room, the first thing I did was to book a massage. While the spa treatments selection was limited, the full body massage felt like heaven; especially with days packed with outdoor activities, a little pampering was greatly appreciated. After exploring Romania, It's hard to decide which hotel is the best in the country. But the Hotel Privo in Târgu Mureș is undoubtedly one of the tops. If you are planning to cruise the oh-so-famous district of Transylvania, I recommend spending at least a night at Hotel Privo. Hotel Privo kindly hosted me, but as always all opinions are my own. Planning to visit Romania or would like to visit? Pin it!